Last week I shared a roundup of articles I had written that share how to sell sound effects. What’s the best topic or theme for my first sound fx library? What is the best subject for a sound collection? What title is best for a new sound clip library? How do I find a good idea for a new sound fx library? Today’s post will be a roundup of advice I’ve shared to answer that question both here, and on other websites. First, let’s start with the broad strokes about designing sound libraries, then move to specific ideas. Theme-based bundles. Bundles focused on a single topic, for example waterfalls, cars, birds, and so on. Need-based bundles. Bundles that help fix a need the pros have, such as a starter kit, an add-on bundle, a construction kit, or others. Supplying quality. These sound fx are valuable because they supply craftsmanship, high fidelity, superior audio quality, and are authentic. This makes a sound library valuable even if other publishers have released similar library themes. Providing value. The library subject helps sound pros in some way, such as by solving problems of not enough time, not enough money, or not enough freedom to capture the fx themselves. Fulfilling cravings. Gives sound pros the sounds they need. More on this below. What about the sound clips within each bundle? What type of sound fx should you choose to ensure your sound library is prized among sound pros? How to Build a Viable Sound Library explores that question. That post explains how to begin by recording foundation sound effects, then shares the process of turning them into signature sound fx that radiate your own distinctive flair as a field recordist and sound designer. How to Build an Irresistible Sound Library To Evade Competition takes that step a bit farther by examining what you can do to make your sound libraries unique and irresistible. Introducing a New Sound Effects Podcast. The State of Indie Sound Effects. A Sound Effect also interviewed me about a book I released about sharing sound. I talked about sound effect topics there, too. The main idea behind every link listed above is that if sound library success is expected solely from a topic itself, it will probably not be successful for long. Sound libraries need something more fundamental than a “silver bullet” theme to avoid being replaced or becoming irrelevant. Specialized vehicles, recorded film- or game-style. Early vehicles. Debris. Light movements of any element. Hi-tech non-sound design recordings from any industry. “Flexible” crowd without technology (e.g., traffic, modern sounds) that can be used in any era. Realistic sounds from historical eras: weapons (e.g., bows, catapults), craftsman sounds (e.g., blacksmith, looms). Walla or small, light crowds performing naturally. Sports crowd without close voices, and without PA or music. Natural human sounds. Yells, screams, burps, groans, grunts, and so on performed naturally. They are many human libraries like this, but most are exaggerated or comedic. Ambisonic libraries. Ambisonic field recordings are mentioned quite a bit. However, I’m not convinced they will have broad appeal and staying power beyond a few years (I hope I am wrong). Providing an ambisonic sound library now could do well if clip duration, library size, and price is balanced well (e.g., ambisonic libraries suffer from packaging issues, so that’s best avoided). Vehicle sound libraries. There are many vehicle libraries out there but most are not prepared or published in user-friendly ways. Many are also greatly overpriced. It takes a lot of time to create a vehicle sound library, but unfortunately the market won’t bear highly priced vehicle libraries. Reasonably priced film- or game-style vehicle libraries cut properly with good metadata and file organization have great potential. Door sound libraries. There are many out there, but most do not have enough variation in performance or recording perspective. Many also could improve upon sound quality. This topic is safe since a sound editor can never have enough door sounds. Whoosh sound collections. 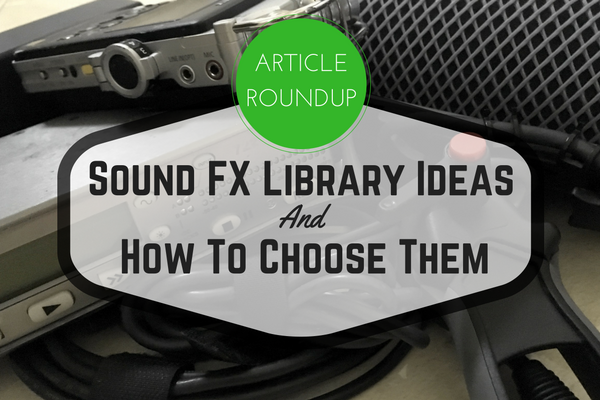 While sound design libraries are generally overdone at the moment, this topic is always popular. The library will need to be creative to stand out. Suggestion: divide whooshes by frequency range and duration. Here are a few other suggestions of topics from the A Sound Effect blog (article one, article two). Elements: metal, wood, glass. Natural elements: water, ice, snow, dirt, rocks, waves. These are always useful but at the moment the market is saturated. Note: these libraries can do well if a field recordist takes a different spin on them using ideas from the Sound Effects Star. Sharing Sound Online. How to build your own indie bundled sound library and sell it from a Web shop you build yourself. The section “Building a Sound Effects Bundle” helps with concrete approaches to building a good sound fx library.